Batman vs. Superman & Justice League Shooting Back to Back? If you think about it, it makes perfect sense for Warner Bros. and DC Comics to shoot their Man of Steel sequel, Batman vs. Superman, and the hopes for an Avengers-type smash with The Justice League, back to back. Zack Snyder is getting ready to aim his cameras on Henry Cavill for his second go-around as Superman and Ben Affleck as Batman. With the news that Batman vs. Superman has added Gal Gadot as Wonder Woman and the rumor mill having Dwayne Johnson as Green Lantern, we’re thinking this is what’s happening. And if that’s the case, then the Batman vs. Superman world probably will be a lot less crowded than previously thought. 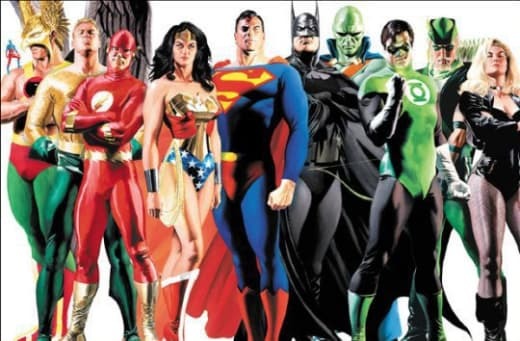 We’re betting that if Batman vs. Superman and The Justice League are set to go one-two with Snyder helming, then the rest of the Justice League (Wonder Woman, Green Lantern, The Flash (who should play The Flash?) and Aquaman will show up towards the end of the film with it ending on one mother of a cliffhanger. Lately, DC has been making Marvel-like moves after a history of not quite getting it right beyond their Superman and Batman franchises. They have long wished for a Justice League movie, but with Ryan Reynolds' Green Lantern folding and a Wonder Woman project failing to ever gain momentum, it appeared that it might simply be a pipe dream. But with this new theory in place, we can see how Batman vs. Superman will focus on those two superheroes battling an evil foe like Lex Luthor (and perhaps a second?) and then it leaving us breathless as the remainder of the Justice League shows up… ready to battle in their own movie that follows. Does it make sense to film Batman vs. Superman and The Justice League together?